Stereotactic radiosurgery (SRS) has emerged as a common adjuvant modality used with surgery for resectable brain metastases (BMs). However, the optimal sequence of the multi-modality therapy has not been established. The goal of the study is to evaluate 6-month local control utilizing pre-operative SRS followed by surgical resection for patients with 1–4 brain metastases. This prospective, single arm, phase II trial will recruit patients with up to 4 brain metastases and at least one resectable lesion. All lesions will be treated with SRS and symptomatic lesions will be resected within 1–4 days after SRS. Patients will be monitored for 6-month local control, in-brain progression free survival, distant in-brain failure, rate of leptomeningeal spread, radiation necrosis and overall survival. Additionally, we will also perform correlative radiobiological molecular studies to assess the effect of radiation dosing on the tumor tissue and clinical outcomes. We expect that pre-operative SRS to the gross tumor prior to surgical resection will improve local control and decrease leptomeningeal failure. Our study is the second prospective trial to investigate the efficacy of pre-operative SRS in the treatment of multiple BMs. In addition, the correlative molecular studies will be the first to investigate early response of BMs at a cellular and genetic level in response to radiation doses and potentially provide molecular prognostic markers for local control and overall survival. Clinicaltrials.gov identifier: NCT03398694 (registration date: January 12, 2018). Several clinical studies evaluating the role of post-operative SRS in management of BMs concluded that SRS is a safe and effective adjuvant treatment strategy for BMs (Table 2). A systematic review of 14 studies involving 629 patients treated with SRS after surgical resection showed pooled LC rate of 83%, distant intracranial failure of 49% and need for salvage WBRT in 29% of cases. In addition, time to salvage therapy from initial resection was found to be 8.4 months and 10–33% of patients suffered cavity-SRS induced complications such as radiation-induced edema in 43% and radiation necrosis (RN) in 23%. Two recently published phase III trials of post-operative SRS by Mahajan et al. and Brown et al. demonstrated local control efficacy and neurocognitive preservation compared with WBRT, respectively. [9, 21] Mahajan et al. prospectively randomized 132 patients in a single institution phase III study comparing observation and post-operative SRS and showed a significant improvement in local tumor recurrence-free rate at 12-month in post-operative SRS arm (72%) compared to observation arm (43%). In the same journal issue, Brown et al. reported a multi-center prospective randomized phase III study to compare the post-operative SRS and WBRT in a total of 194 patients and observed similar overall survival but significantly improved neurocognition in post-operative SRS compared with WBRT. Interestingly, their secondary endpoint analysis demonstrated a lower surgical bed and local control rate as compared to data previously reported. [9, 21] With a 6-month surgical bed control of 80.4% and an estimated 60.5% at 12-month, the author discussed that lower LC rate after SRS could be due to falsely elevated frequency of recurrence by including “pseudoprogression” on imaging and patients and tumor mark-up differences between trials. Although there has been some discrepancy in the literature regarding to local control rates in patients receiving post-operative SRS (Table 2), these studies nevertheless support the combination use of surgery and SRS as an effective way to treat brain oligometastasis to delay WBRT and the associated neurocognitive and quality of life decline. The drawbacks for post-operative SRS include the need for cavity margin expansion, the unpredictability of patients’ postoperative course and potential delay in SRS treatment after surgery. Soltys et al. analyzed 76 post-operative SRS cases and demonstrated that increasing conformality index significantly correlated with improved LC and concluded that a 2-mm margin should be used around the resection cavity due to the possible imprecise nature of defining the target volume in a post-surgical setting. Therefore, clinicians began to investigate an alternative paradigm of using preoperative SRS to reach excellent local control and preserve cognitive function. The first pre-operative SRS study was published by Asher et al where 47 patients were treated consecutively with neoadjuvant SRS before surgical resection, with 24 of those patients analyzed as part of a prospective trial, and the results showed 6-month and 12-month LC rate of 97.8 and 85.6% respectively (Table 3). Subsequently Patel et al performed a multi-institutional retrospective comparison of outcomes and toxicities for pre-operative SRS compared to post-operative SRS for 180 patients. The planning target volume (PTV) of pre-operative SRS had 0 mm margin expansion from gross tumor volume (GTV) compared to 2 mm margin for PTV of post-operative SRS. The study did not note any statistical difference in the rates of local recurrence, distant brain recurrence, and OS but the pre-operative SRS cohort demonstrated significantly lower rates of symptomatic RN (4.9% vs. 16.4%, p = 0.01) and LMD (3.2% vs. 16.6%, p = 0.01) than their post-operative SRS counterpart. The abstract of an updated retrospective analysis of 117 patients with 125 lesions treated with pre-op SRS is now available online (https://www.redjournal.org/article/S0360-3016(18)31346-4/fulltext) and reported the 1 and 2-year cavity LC rate to be 80.1 and 74.9%, distant in-brain failure (DBF): 45.3 and 60.2%, and LMD: 4.3 and 4.3%, respectively. Nevertheless, the results were likely limited by some intrinsic selection bias, as the two retrospective cohort groups were statistically different in their baseline performance status (Figure 1). In this prospective phase II trial, we will establish the efficacy of pre-operative SRS in local disease control. Since the tumor will be resected within 4 days of the delivery of the radiation, we will treat lesions up to 5 cm in size with SRS. In addition, there is no available published literature that describes early tumor cell molecular responses to radiosurgical doses of ionizing radiation in humans. We will simultaneously perform an exploratory analysis regarding histologic and molecular changes after radiosurgery for specimens removed to determine correlation between response to radiation at tumor margin and LC. This analysis will potentially provide molecular prognostic data for local and overall outcomes of patients with BMs. 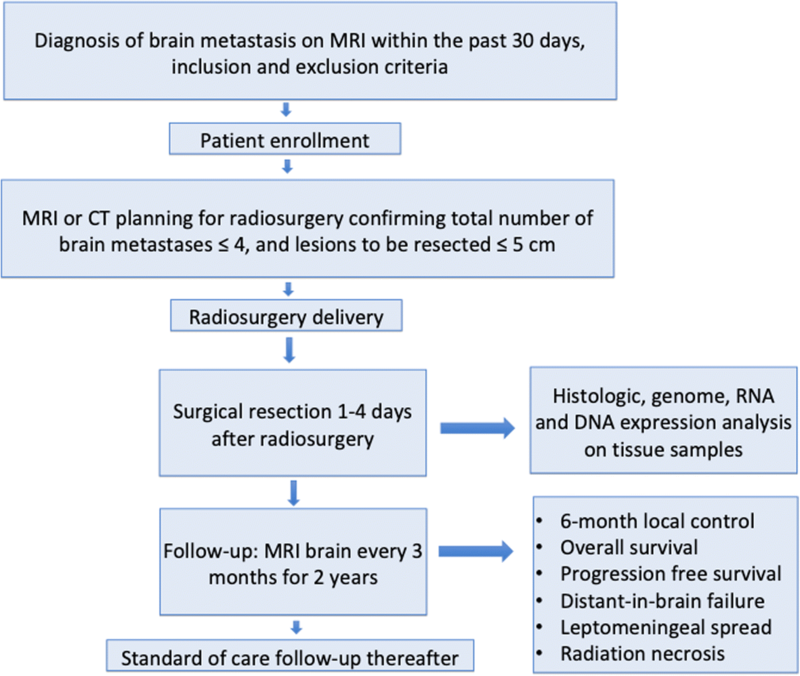 To evaluate 6-month in-brain local control utilizing pre-operative SRS followed by surgical resection for up to 4 brain metastases. Molecular studies to investigate the relationship between radiation dose and DNA damage in tumor tissue. In addition, characterization of early histologic and molecular changes, in terms of gene expression, seen within the tumor following radiation. This is a single-center, single-cohort, single-arm, prospective phase II trial to determine the local control at 6 months utilizing pre-operative SRS followed by surgery within 1–4 days of radiation treatment in neurologically symptomatic patients with up to 4 brain metastases. Patients with 1–4 metastatic lesions in the brain identified on a diagnostic brain MRI or CT with at least one meeting the criteria for surgical resection i.e. symptomatic or size > 3 cm, will be identified as potential study candidates. Amongst the study candidates, patients meeting the inclusion and exclusion criteria (Table 4) will be eligible to enroll in the study. Eligible patients who complete the Informed Consent Process will be registered in the OnCore® database and assigned a patient ID number for the clinical study. 3. A diagnostic MRI Brain or CT Head demonstrating the presence of 1–4 solid tumor brain metastases and lesion to be resected no more than 5 cm in any direction, performed within 30 days prior to stereotactic radiosurgery. If multiple lesions are present, then the total brain metastases volume can be no more than 30 cm3 excluding the lesion to be resected. The trial is scheduled to recruit 44 patients and is currently recruiting. The projected duration for the study is 3 years. The time line is outlined in Table 6. SRS will be delivered utilizing gamma knife or linear accelerator-based techniques. With the Leksell Gamma Knife Perfexion®, Leksell GammaPlan® will be used to generate the treatment plan with respect to the head frame coordinate system created by localization. Target volume and isocenter determination will be based on a brain MRI with the patient’s head in the stereotactic frame. Linear accelerator based stereotactic localization will be performed using the Encompass® SRS thermoplastic mask immobilization system. The patient will undergo a 1 mm slice thickness helical CT scan that will be fused with the MRI brain T1-weighted post-contrast axial scan used for target delineation. The CT-MRI fusion maximum correlation error must be less than 1.5 mm. SRS will be delivered to each lesion that has not previously undergone treatment. Due to the volumetric summation constraint for the remaining metastases, no single, non-resected lesion greater than 4 cm will be allowed in the study. If any two lesions are within 0.8 to 2 cm of each other, the intervening midplane dose will not exceed 13 Gy. This may require treating each respective target with a lesser dose than dictated by the above dosing criteria to minimize toxicity. The dose to the critical structures, including optic pathway, brainstem, cochlea and medulla, must meet constraints as designated by Task Group 101. If the above constraints cannot be met utilizing the prescribed radiosurgery dose, then the highest dose to the target volume will be used such that constraints can be met. This will be considered a minor deviation. At least one of the 4 lesions has to be either larger than 3 cm or symptomatic to meet the surgical resection criteria. One to four days after radiosurgery, the dominant lesion(s) will be maximally resected and labeled tissue will be sent to the neuropathology department for clinical diagnosis and radiobiological correlative studies. If for safety concern or other considerations, gross total resection is not reached, the residual disease in the setting of subtotal resection will be closely observed given that it has been treated with a definitive dose of SRS, reserving salvage local therapy for cases of progression. Patients who received subtotal resection will be recorded and analyzed as well for risk stratification. For the radiobiological studies, tissues will be examined for a) pathologic diagnosis b) immunohistochemistry for immune cell infiltrates and c) mitochondrial histochemistry to address DNA damage. In addition, to understand the effect of radiation dosing on tumor tissue at the molecular level, RNA and DNA sequencing will be performed on peripheral and central sites from the tumor specimen of each patient’s tumor samples. The early cellular gene expression changes in response to high dose radiation will be assessed. DNA sequencing and RNA expression will also be correlated with all clinical outcomes to establish prognostic molecular classifications. Protein analysis for apoptotic pathway activation will also be done on tumor cells to assess radiation induced tumor cell killing. Following delivery of SRS and surgical resection, all patients will be assessed for their clinical performance status (GPA/ds-GPA/ ECOG performance status/KPS) as well as toxicity at follow-up intervals as detailed in Table 6. Serial MRIs will be analyzed per RANO-BM criteria for assessment of LC, DBF and cranial progression free survival. Initiation or continuation of chemotherapy, immunotherapy or other systemic agents is allowed per medical oncologist discretion. The Principal Investigator and/or treating physician may choose to withdraw a subject from the study if there are safety or other concerns. Time-to-event analyses will be measured from the date of completion of radiation therapy (Day 0). As outlined in Table 6 patients will be followed at 1-month post radiosurgery, then at 3 month and every 3 months thereafter for 2 years. A detailed medical history, toxicity assessment and physical examination including vital signs will be performed at each visit. Each follow-up starting from 3 month follow up will also include a MRI with the following sequences: without contrast, with contrast, FLAIR, DTI and PWI. The MRI will be analyzed per RANO-BM criteria  for assessment of local control, distant in-brain failure and cranial progression free survival. The MRI will also be analyzed for radiation necrosis and leptomeningeal disease as discussed in methodology section. Cases concerning for radiation necrosis will be further analyzed using MR spectroscopy. After the 2 year follow up period, subjects will be followed according to their treating physician per standard of care approximately every 6 months). Patients will continue to be followed for survival information until death. All AEs considered related to trial medication will be followed until resolution, return to baseline, or deemed clinically insignificant, even if this occurs post-trial. Investigators will conduct continuous review of data and patient safety. Monthly review meetings for moderate risk trials are required and will include the principal investigator, clinical research specialist and/or research nurse. Adverse events (AEs) will be recorded from the time of study intervention and for at least 30 days after treatment discontinuation, regardless of whether or not the event(s) are considered related to trial medications. Any death occurring within 30 days after the study intervention will be reported as a serious adverse event (SAE) regardless of attribution. AEs will be reported to the IRB within 5 days from becoming aware of the event if they are:  unexpected,  related or possibly related to study participation, and  suggests that the research places subject(s) or others at greater risk of harm than was previously known. SAE reports are entered into OnCore® monthly and reviewed by the Data Safety Monitoring Committee (DSMC) chair and/or coordinator monthly. Findings will be reported to the full DSMC at the time of study review. At any time during the trial, the study will be closed early if it is the opinion of the investigators that the risks (or benefits) to the patient warrant early closure of the study. Alternatively, the DSMC may initiate suspension or early closure of the study based on its review of the investigator reports. This study will utilize electronic Case Report Form completion in the OnCore® database. A calendar of events and required forms are available in OnCore®. The OnCore® database is a comprehensive, web-based, Clinical Trial Management System (CTMS) which utilizes an Oracle database. All documents will be kept according to applicable federal guidelines. Clinical trial data in OnCore® are periodically monitored by the IU Simon Cancer Center Data Safety Monitoring Committee. Records of IRB review and approval of all documents pertaining to this study will be kept on file in the Clinical Trials Office and are subject to inspection at any time during the study. Periodic status reports will be submitted to the Institutional Review Board at least yearly, as well as notification of completion of the study and a final report within 3 months of study completion or termination. Accrual data will be entered into the IU Simon Cancer Center OnCore® system. The Protocol Progress Committee (PPC) reviews study accrual twice per year while the PPC coordinator reviews accrual quarterly. Patient recruitment is based on the referral from neurosurgeons, medical oncologists, radiation oncologist, primary care physicians, or self-referral. The principal investigators are responsible for checking eligibility and explaining the study principles, including detailed experimental schedule, investigational treatment, potential risks, and benefits. Radiation oncologists, neurosurgeons, and medical oncologists will be responsible for the consults, clinical treatments and follow up evaluations for the respective specialties. Pathologists will be performing histochemistry, immunochemistry and assist on other aspect of correlative studies. Statistical analysis will be performed by statisticians from the Department of Biostatistics at Indiana University School of Medicine. A sample size of 44 patients will provide 82% power with an alpha = 0.05 to determine if the proportion of patients with local control at 6 months is <= 83% or > = 95%. For the primary objective of 6-month local control for pre-operative SRS followed by surgical resection of the brain metastases, the proportion of patients who have local control at 6 months will be calculated along with a 95% confidence interval. Testing the observed proportion against a baseline 6-month local control proportion of 83% at a one-sided alpha of 5% using a binomial test will be done. The proportion of patients who have in-brain distant failure, radiation necrosis, and leptomeningeal spread in the evaluated patients will be summarized and exact binomial 95% confidence intervals will be determined. Additionally, time to local failure, distant in-brain progression, and overall survival will be calculated and analyzed using Kaplan-Meier methods with the medians estimated with a 95% confidence interval. The probability rates will be provided for 6 months, 1 year, and 2 years. Finally, the tissue biomarkers of interest in the molecular study will be correlated with treated lesion location, in-brain local control, in-brain distant control, and overall survival using Cox proportional hazards regression. Time dependent ROC curves will be generated to assess predictive ability. To date, most studies have evaluated the role of SRS post-operatively in patients with clear indications for surgical management of BMs. [13, 20] We believe that pre-operative SRS merits further investigation as this technique has several clinical and radiobiological advantages, including precise tumor definition, possible sterilization of the tumor margin prior to surgical resection leading to decreased microscopic spread of disease during surgery, removal of irradiated tissue, and a theoretical radiobiological advantage of intact vasculature optimizing oxygenation. Additionally, all prior SRS studies limit indication of SRS to lesion < 4 cm in size due to dose related toxicity. Since we will be resecting the lesion post SRS, we will include lesions up to 5 cm in size. We expect that, compared with historic LC rate associated with post-operative SRS, pre-operative SRS will have a higher LC rate as well as decreased risk of LMD and symptomatic RN. In terms of radiobiological studies, we expect differential gene expression profile in the tissue from the center of the lesion, which receives 50% greater radiation dose compared to the periphery of the lesion. In addition, we expect to see higher percentage of immune cell infiltrate in the radiation treated lesions. Our exploratory analysis regarding histologic and molecular changes after radiosurgery will determine if any correlation between immune response to radiation at tumor margin and local control exists. This may characterize a group of patients requiring additional therapy after pre-operative radiosurgery and surgical resection for maximal tumor control. Authors would like to thank Heather Cero, Jennifer Pencek, and Lauren Snyder for research administrative support. This study is supported by IU Health Values Fund (Indiana University Health Grant number VFR-456-Dey) financed by Indiana CTSI (Clinical and Translational Science Institute), Indianapolis IN, USA. The dataset used and/or analyzed during the current study will be published in the form of manuscripts upon completion of the study and will be available from the corresponding author after publication on reasonable request. Study conception MD, NA and GW. Initial Study design: MD, NA and GW. Revision of study design and protocol: MD, NA, GW, AV. Study coordination: MD, GW, AV. Participating centers: Indiana University Methodist Hospital, Indianapolis, IN 46202, USA. Drafting the manuscript: WH, SS, JM, CK, MS, TP, JJ, MD. All authors read and approved the final manuscript. This study will be conducted in compliance with international Conference on Harmonization-Good Clinical Practice (Food and Drug Administration guideline) and with all applicable federal (including 21 CFR parts 56 & 50), state and local laws. The Institutional Review Board (IRB) has approved the protocol and the informed consent form, for this study. Informed consent and HIPAA authorization will be obtained prior to patients’ enrollment in the study and registration in the OnCore® database.